Milia, milk spots, annoying little blemishes: whatever you call them, those small white bumps that pop up around your nose, upper cheeks and eyes can be frustratingly difficult to get rid of. While they may look like little whiteheads, trying to pop them will only cause inflammation and the solid little white bump will remain. While they can make an appearance at any stage of life, they do tend to be quite common in babies and they are simply the product of keratin becoming trapped beneath the very surface layer of your skin. Common triggers for the appearance of milk spots or milia on your skin include sun exposure, laser therapy, anything else that causes burning or blistering of the skin, and the use of topical treatment like steroid cream. While you might not like the look of them, rest assured milia are completely harmless and do not carry any health risks. However, if you’re a bit of a perfectionist, you probably still want to get rid of them. Lucky for you, we have tried and tested some easy and safe home remedies for milk spots. After weeding out the ineffective ones, we are happy to present you with the 7 best and most effective natural home remedies for milia. That humble package of oatmeal you have sitting in your kitchen cupboard could be just what you need to do away with milk spots for good. As a bonus, oatmeal is great for the general health of your skin too. All you need to do to make this simple, gentle exfoliant is grind up a tablespoon of oatmeal in a spice grinder. Mix in a few drops of water (or for added oomph, honey) until you have a thick paste that will be easy to apply to your face. Since this exfoliant is going to be a healthy treat for your skin, feel free to apply it all over your face, let it sit for 5-10 minutes and then give it a good scrub before washing it off, focussing with gentle attention on the areas with the milk spots. To help get those pesky little keratin plugs we’ve come to know as milia out of your skin, you can try treating yourself to a daily steam treatment until they’ve cleared up. To do this, simply boil some water and pour it into a bowl or basin. To make it extra luxurious, add tea tree, eucalyptus, or your favorite essential oil. Alternatively, you can add fresh herbs like rosemary or mint to the water and give them a stir. If you’re comfortable with it, you can place a towel or wide scarf over your head to keep the heat in. However, it’s perfectly fine to just hold your face over the bowl. The steam will help open up your pores and, as a bonus, should help with any stray blackheads or acne spots. Remember how we mentioned you could boost the power of your oatmeal scrub with honey? 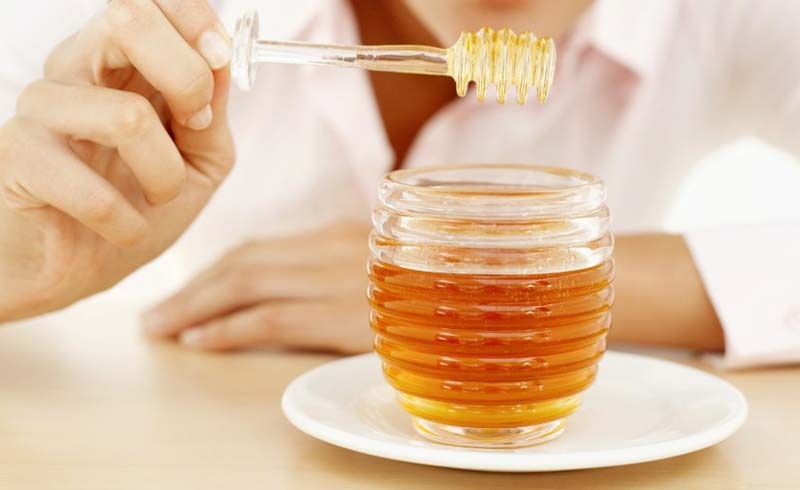 Well, that’s because honey, with its powerful antimicrobial, antiseptic and healing properties, is a remedy for just about everything, milk spots included. Since we don’t recommend scrubbing with oatmeal every more than twice a week as your skin needs a break from abrasiveness. It’s worth popping a bit of honey on as a daily spot treatment. It’s important to ensure you’re using an organic honey, preferably raw. Leave this natural milia spot treatment on for about 20 minutes and then rinse your face with warm water. Packed full of skin-clearing vitamin C, tomatoes are a fantastic remedy for milia. It’s also a nice and easy method to follow. All you need to do is slice the end off a tomato and rub it over the milk spots on your face. Allow the juice to settle on your skin and leave it there for up to 20 minutes before gently rinsing with warm water. The wonderful thing about this little trick is that you can take advantage of it pretty much anytime you’re including tomatoes in a meal. We’ve found twice a week to be an ideal regimen for clearing up those pesky white bumps around the eyes. Here’s another effective, natural milia treatment that has some side benefits for other parts of your face. Castor oil is known to have a whole range of health benefits, not the least of which being healthy hair growth. When carefully applied to your eyebrows and lashes, castor oil can stimulate growth. While you may not end up looking like Cara Delevingne, many people swear by castor oil’s ability to thicken and lengthen your hair. You’ll be pleased to know castor oil is also a highly effective treatment for milk spots. Simply combine one teaspoon of the oil with a teaspoon of good quality olive oil. Mix it all up and carefully apply the mixture to your milk spots and, if you’d like, your eyebrows and lashes. Leave it on for around 10-20 minutes before rinsing your face with warm water. As with all of these treatments, please be careful when applying the mixture as you don’t want anything getting in your eyes. Here’s another exfoliating method you may wish to test out in your quest to clear up your milk spots. As with the oatmeal scrub, and any other exfoliants you use, it is important not to overdo it as you can damage your skin. We suggest once a week, definitely no more than twice. For this scrub, mix one teaspoon of sugar with the juice of half a lemon. Gently (and we mean really gently) massage this mixture into your face, focussing on the areas with milk spots. Use a circular motion and remember, you don’t want to damage the gentle skin around your eyes. Continue for a few minutes with these soft, circular motion and then rinse with warm water. There’s nothing like a good, natural home remedy left to work its magic overnight. When it comes to milk spots, our favourite overnight treatment has to be tea tree oil. This powerful oil can be found in almost all health stores and even supermarkets. The reason? It really should be a staple in every home. Used for everything from wound healing and acne clearing to making natural deodorants and insect repellants, tea tree oil is one of the most powerful natural remedies around. To ensure you wipe out your milk spots for good, ensure you get yourself a top quality, genuine tea tree oil. Then, all you need to do is apply it directly to the milia as a spot treatment. Leave it on overnight and then simply rinse your face in the morning. Be careful not to overapply as you don’t want any getting in your eyes. Keep this up every night until you awake one morning to the happy discovery that your milia have disappeared.